Equifax Inc. EFX announced yesterday that it has entered into a partnership with World Economic Forum's Centre for Cybersecurity. The collaboration is aimed at sharing best practices to foresee and identify potential cyber threats as well as strengthen cybersecurity globally. The move follows Equifax’s partnering with Better Identity Coalition to find solutions for enhanced and more secured identity verification beyond the Social Security Number. Also, the company is undertaking efforts to leverage Atlanta for the Advancement of Security (“ATLAS”) to boost assistance for a better identity solution. Equifax is striving to enhance and strengthen cybersecurity globally. This reflects the company’s increased efforts to revive from the 2017 cyberattack and bring back customers’ confidence. The company’s third quarter 2018 earnings continued facing the brunt of data breach where customers were seen cautious about the company’s cybersecurity practices thereby deferring their purchases. Costs associated with the incident dented Equifax‘s earnings in the quarter, which declined 7.8% on a year-over-year basis. Shares of the company have lost 9.9% in a year’s time, against the industry’s rise of 22%. 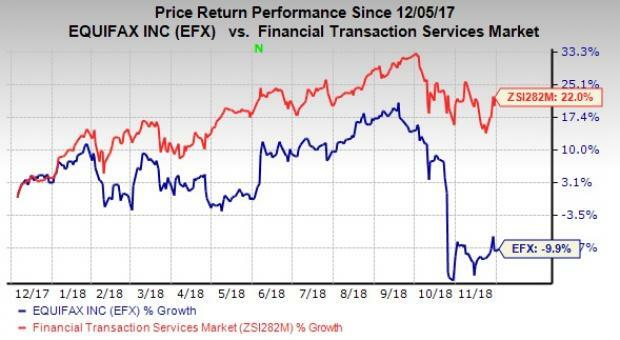 Currently, Equifax carries a Zacks Rank #4 (Sell). You can see the complete list of today’s Zacks #1 Rank (Strong Buy) stocks here. A few better-ranked stocks in the Zacks Business Services sector are Booz Allen Hamilton Holding Corporation BAH, BG Staffing, Inc. BGSF and Robert Half International Inc. RHI, each carrying a Zacks Rank #2 (Buy). The long-term expected EPS (three to five years) growth rate for Booz Allen, BG Staffing and Robert Half International is 14.4%, 20%, and 13.3%, respectively.